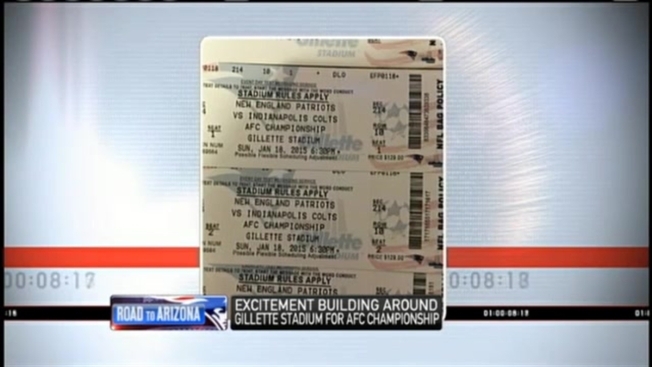 If you bought tickets for this Sunday's Patriots-Colts AFC Championship game through some guys in Somerville, Mass., you found through Craigslist, you may want to doublecheck whether those tickets are real. Somerville Police said Friday they had arrested three men from New York City and a juvenile on charges of selling fake tickets. Police said a Billerica, Mass., resident reported paying $900 for four tickets to the men at the East Somerville Holiday Inn. The three adults, Jatquan Hyman, 20, Jarrell Inge, 26, and Jose Lopez, 22, who all have New York City addresses, are being held in the Billerica jail, police said. Detectives seized thousands of dollars in cash and several addition bogus tickets, police said. The scam warning came as sales of legitimate, official Patriots gear were booming at their pro shop at Gillette Stadium in Foxborough. "I think people are starting to get excited," said Kathryn Whiffen of Hull, Mass. "People are spending money and having a good time." Anthony Pope of Plainville came in to buy three jerseys for his three sons. "It feels great, just gearing up for the game," Pope said. Also gearing up for the game were staff at the Renaissance Hotel at Patriot Place, where hotel rooms for Saturday and Sunday nights were going for as much as $900. A package deal with hotel room plus tickets in the lower bowl of seats sold out in less than an hour after the Patriots defeated the Baltimore Ravens last Saturday night to advance to the conference championship. In addition, a fourth suspect, later identified as 22-year-old Randy Garcia from New York City, was arrested Friday afternoon for attempting to sell four fraudulent playoff tickets for $800. He is expected to be arraigned in Boston Municipal Court on Tuesday.